Delacorte Books for Young Readers, 9781101940136, 496pp. The third book in the Explorers series has more mystery, more bravery, more danger than ever before! The perfect read for fans of Chris Grabenstein and The Mysterious Benedict Society! Sebastian is still at large, kidnapped again! Evie is still missing her grandfather, the leader of the Filipendulous Five! And there's still an explorer hanging from the edge of a perilous cliff! 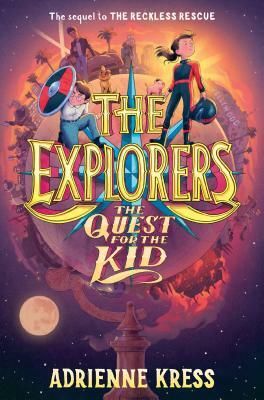 All this and more in the third book in the Explorers series: The Quest for the Kid. Adrienne Kress is a writer and an actress born and raised in Toronto. She is the daughter of two high school English teachers, and credits them with inspiring her love of both writing and performing. She also has a cat named Atticus, who unfortunately despises teeny hats. She is the author of The Explorers: The Door in the Alley; The Explorers: The Reckless Rescue; and The Explorers: The Quest for the Kid. To find out more about Adrienne, visit AdrienneKress.com and follow @AdrienneKress on Twitter and Instagram.